We make it easy to PTZ! 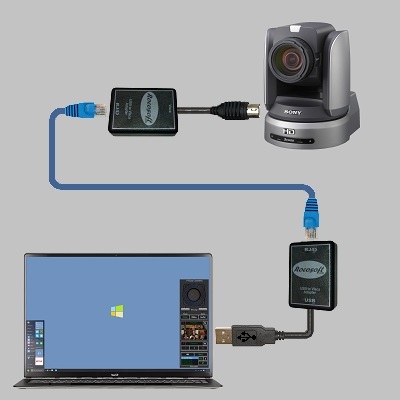 Use a single or multiple USB Joysticks to turn a regular Windows computer or tablet into an advanced camera control station. Designed to be used with the industry’s top live streaming solutions, this software unveils the true possibilities for robotic cameras. Designed to simplify the logistics of preset switching, the Preset Visualizer Panel creates a visual camera preset layout for preset recall that is perfect for working with detailed video production environments. Camera operators can now do more with less. Just add your Network Cable! We take the guess work out of connecting your PTZ Cameras and greatly simplify your installation process with our convenient VISCA Control-Video-Power Extendable Balun Cable Sets. 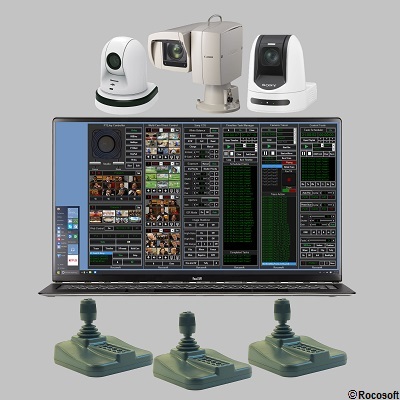 Rocosoft PTZJoy™ Controller is a professional multi-camera control software for local and far-end management of Broadcasting PTZ cameras. It offers precise and responsive camera controls and advanced functionality that is simply not available with any other hardware or software controller on the market. Our PTZJoy Controller Software will allow you to ditch your bulky limited functionality hardware joystick controller and replace it with the computer based controller that is more precise and offers tons of extra features. Even our simplest controller software, used in conjunction with any USB joystick will give you more precise and simultaneous pan, tilt, zoom controls with true variable speed plus a lot of extra features.You can control pan, tilt, zoom, focus, iris and easily switch between cameras using any professional or gaming, wired or wireless, xBox or regular USB Joystick. You can also use virtual on-screen controls, keyboard shortcuts, or directional on-screen buttons and manage camera presets with visual preset tiles that offer full customization with your own graphics. Designed to be used with the industry’s top live streaming solutions and professional robotic cameras, our software offers the best visual AR camera control technology available in the industry as well as the functionality that you just can’t get with any hardware Controller. 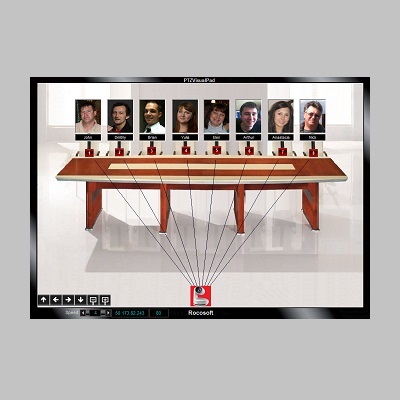 With powerful camera automation tools, far-end camera control, and our innovative PTZPad™ Visual Control Switchboard for advanced preset management, camera operators can now do more with less and create stunning live broadcasts without the TV studio budget. Watch our overview video on PTZJoy and PresetVisualizer to learn just how powerful it is. In the video, you will see how to use PTZJoy to control multiple cameras from one computer. We discuss how to manage presets, set up visual preset buttons, use a USB joystick, automate your cameras, edit fine details such as exposure and white balance, along with many more. On top of that, we show you how to use our PTZLayer technology to overlay PresetVisualizer over an NDI or VLC video stream, where you can then drag-and-drop presets onto their corresponding locations to give you a visual representation of your PTZ setup, making it easier to manage your cameras and their presets.